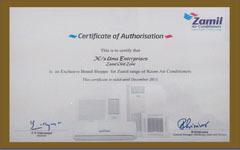 Uma Enterprises is an authorized AC Dealer in Noida of many well know air conditioners Brands. 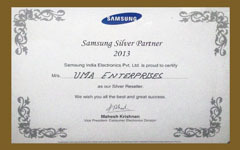 Specializing in the selling and servicing of air conditioners for more than 10 years, Uma Enterprise has built a reputation for competitive pricing, quality products and efficient service. We deal in air conditioners of leading names in supply like Daikin Air conditioners, Mitsubishi Heavy Air conditioners, Samsung Air Conditioners and Zamil Air conditioners. 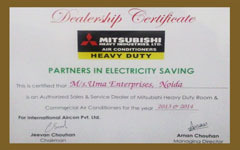 We also deal in VRF & VRV Systems and Central Air condition Systems for various industries. Currently we have our office at Noida. Our own qualified and experienced mechanics install air conditioners to exacting standards of workmanship. Our services include planning and output calculations to offer you the most suitable units according to the room size and the room application then install the best system for your requirements in time with professional manners. Through a genuine commitment to quality and service and by remaining focused on the customer's individual requirements has enabled us to sustain growth among all industries and our large client portfolio reflects a broad mix of Individuals, Companies, Institutions from Corporate offices to Multinationals, serving in all areas.